Michigan has landed their fourth commitment in less than a week, via the pledge of 2016 Running Back Matt Falcon. Falcon is an absolute workhorse, and a perfect fit for the "ground and pound" running game that Jim Harbaugh is trying to bring back to Michigan. He has a solid frame standing at 6'1 and weighing 210 lbs. For someone who suffered a very serious injury earlier in his career, he has no side effects still lingering. He's able to change direction on a dime and cut back across the field. He has very good speed for someone his size, and won't shy away from contact. Possesses above average lateral speed and can cut sideline to sideline with relative ease. Does an excellent job of waiting for blocks, then hitting the hole with good speed. Gets low when about to get tackled and will try to run over the defender. Big, strong body with room to grow. Excellent field vision and seems to always know where his blocks will be. Good burst off the line of scrimmage and has decent top end speed. Won't be caught from behind. 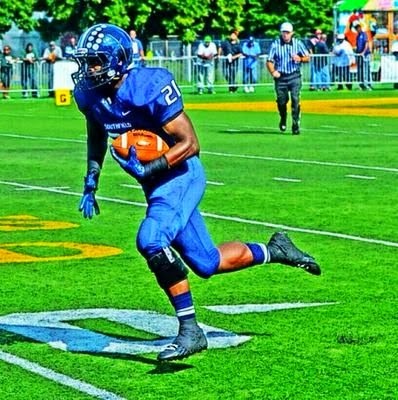 In my opinion, Matt is an extremely underrated recruit and is by far the best running back in the state of Michigan in 2016. With Matt’s commitment, Michigan now has two running backs in the fold that will compliment each other very well. The coaching staff will likely be done recruiting running backs for the rest of 2016, and now focus on finding playmakers on the defensive side of the ball. Matt becomes the sixth member of Michigan’s 2016 recruiting class joining; OT Erik Swenson, QB Brandon Peters, LB Dele Harding, FB/LB David Reese, and RB/FB Kingston Davis.